Two Reuters journalists accused of breaching Myanmar’s state secrets law during their reporting of a massacre of Rohingya were jailed for seven years Monday,Mizzima News carries a report by AFP. According to the report, Myanmar nationals Wa Lone, 32, and Kyaw Soe Oo, 28, charged with violating the Official Secrets Act, a draconian British colonial-era law which carries a maximum sentence of 14 years. 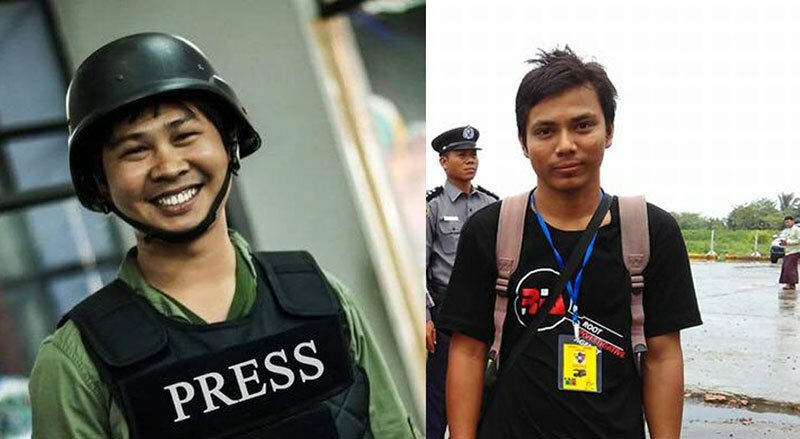 The two journalists have been held in Yangon’s Insein prison since their arrest in December.The case has generated lot of hue and cry among the international community as an attempt to muzzle the voice of press. Around 700,000 Rohingya fled to Bangladesh following army atrocities in Myanmar. The Reuters journalists denied the charges, insisting they were set up while doing their jobs to expose the extrajudicial killing of 10 Rohingya Muslims in a Rakhine village in September last year, the report said. According to the Reuters journalists they were invited to dinner by police who handed them documents before the pair were arrested as they left the restaurant for possessing classified material. The judge found that the ‘culprits’ intended to harm the interests of the state.So he pronounced verdict of seven years sentence for the reporters.